The Fulton Center isn’t a great building, but it does have its moments. Observation post (with container). 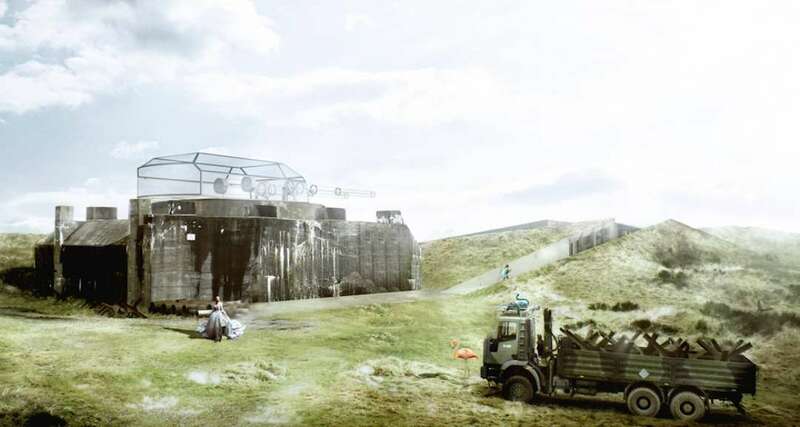 These drawings, taken from Bunker Archeology, show just how massive these structures are. The heavy black lines represent solid concrete but remind me of the poché on a Beaux-Arts-style drawing. “One of the essential characteristics of the bunker is that it is one of the rare modern monolithic architectures.” So writes philosopher-artist-dromologist Paul Virilio in his exegesis of World War II defensive fortifications, Bunker Archeology. These poured-in-place pillboxes aren’t just modern, they’re modern concentrate—efficiently constructed for a single purpose and devoid of any style or ornament because, as Virilio writes, “the omnipotence of arms volatilized what was left of aesthetic will.” If Le Corbusier’s houses are machines for living, the concrete bunker is a machine for surviving, designed to stand against bombs, bullets, gases, and flames. But in parts of the world where war is now a fading memory, bunkers linger on this earth without purpose, decaying, tied inextricably to the past, a haunting reminder of violence, a ghostmodern architecture. Some of these underground bunkers were incredibly expansive, intended for long-term occupation, but many others were martial follies. Today, they’re half-buried along coastlines or looming silently and mysteriously in the middle of cities, too massive to be destroyed but often too difficult to be repurposed. Apparently, a side effect of being built to withstand mortar attacks is the ability to confound planners and developers—perhaps there’s a lesson there. Yet despite the difficulty of renovating a structure with a wall thickness measured in feet, some enterprising organizations and architects are doing just that, appropriating bunkers to imbue them with a new life and new meaning. BIG’s Blåvand Bunkermuseum reconstructs the bunker’s original cannon out of glass “as a ghost or a reflection of the war machine it was meant to be.” For Virilio, the removal of a cannon “deconsecrates” a bunker. By that logic, BIG’s project re-consecrates the structure for a new denomination. The canon, once an instrument of ruination, is now an instrument of illumination, a skylight above an exhibition space. BIG describes its design as the “antithesis” to the existing structure: “vacuum rather than volume—transparency rather than gravity.” These are themes that recur in many of these projects. Among architects, there seems to be renewed interest in Brutalism these days, and on purely aesthetic terms, it would be easy to think of these projects as examples of a New New Brutalism. After all, the Brutalist buildings of the 1950s and ‘60s were often derided as “bunkers,” although their raw concrete surfaces are more likely to harm their occupants than any invading military force. But like any good -ism, these projects represent both an aesthetic and an ethic. There’s actually a lightness to all these structures, an effort to mitigate the weight of the original bunker—and not just its literal weight. These bunkers carry a historic heaviness. They can be a psychological burden for people who don’t want to be reminded of the horror of war, but who are confronted by it every day, who literally live with it. While these renovations can’t erase the past, they can imbue its relics with new meaning. John McClane crawls through the mechanical spaces of Nakatomi Plaza in Die Hard. The following essay on Die Hard, Kafka, Deleuze, The Towering Inferno, Inception, James Bond, Heating, Ventilation, and Air Conditioning originally appeared in Volume 37: Is This Not a Pipe? Workers furnish Queen Mary’s Dollhouse in the drawing room of Lutyens’s London apartment (via The Queen’s Dolls’ House by Lucinda Lambton). Edwin Lutyens (1869-1944) was one of the foremost British architects of the late 19th and early 20th centuries. Though his name may not be particularly well known today, he was one of very few contemporaries of Frank Lloyd Wright whose work the American architect not only admired but openly praised to his students, despite the vast difference in their styles. Lutyens was known for designing exceedingly beautiful classically influenced country houses with exceedingly British names like Little Thakeham (1902), Heathcote (1906), Great Maytham (1912), and Benedict Cumberbatch, but his grandest commission was the plan for New Delhi and the enormous Viceroy’s House there. But right now, I want to take a closer look at the smallest house Lutyen’s ever designed: The Queen Mary’s Dolls’ House. Like most good ideas, the dollhouse was conceived over glasses of champagne with a princess – in this case, Princess Marie Louise, granddaughter of Queen Victoria, who asked Lutyens to construct a massive dollhouse for her cousin Queen Mary. It took too three years for Lutyens and a team of 1,500 people –artists, craftsman, gardeners, and even vintners– to finish the project. It was constructed to be a paean to British craftsmanship and ingenuity and Lutyens insisted that every fixture be operable. The miniature gramophone plays, the sinks run hot and cold, and the library is filled with hundreds of tiny books (many written by prominent British authors especially for the library), and a wine cellar full of tiny, bottles of wine – perfect for those times you want to sit back and relax with a thimble full of wine. When it was completed in 1924, the Queen Mary’s Dolls’ House. was exhibited at the British Empire Exhibition. Built at the scale of one-inch equals one-foot, the five-foot-high dollhouse serves as a particularly fine record of the era’s architecture and can still be seen at Windsor Castle.